Oddly consigned by U.S. rights holders MGM to indie label Kino Lorber, Sergio Leone's seminal Fistful of Dollars* (Per un pugno di dollari, 1964) has been reissued on Blu-ray with a brand-new 4K restoration, sourcing the original Italian Techniscope camera negative. In terms of clarity, the image is a vast improvement over MGM's earlier, problematic Blu-ray, which was forced to use a patchwork of secondary film elements. This new release has been criticized by some for its color choices, but unlike radical alterations done on movies as varied as The French Connection and Hammer's Dracula, I found these choices entirely valid and not distracting. The movie, of course, has been written about to death, so what chance does this critic have trying to add new insights? Euro-Westerns are as old as cinema, but in the modern sense Leone's Fistful was predated by a number of important films: Hollywood movies that began shooting in Spain (The Sheriff of Fractured Jaw, Savage Guns, etc. ; three Spanish Westerns filmed before Fistful (notably Gunfight at Red Sands), and perhaps most significantly, a wildly popular series of West German-made Westerns adapted from stories by Karl May. Those films, most often about the noble Indian Winnetou, were generally filmed in Yugoslavia and, stylistically, more closely resembled Hollywood Westerns of the 1950s. But Leone's Fistful almost literally changed the genre overnight. Peplum had dominated production in Italy since 1958, but Leone's film killed it utterly. A year after Fistful's release, that genre was effectively dead, and the directors, screenwriters, and casts of those movies traded in their swords and sandals for six guns and cowboy boots. More than 300 films in the Leone style were eventually made. The familiar, time-worn plot opens with the Stranger* (Clint Eastwood) riding into the small Mexican town of San Miguel. The local innkeeper, Silvanito (José Calvo) informs the Stranger that two crime families are fighting for control of the town. At one end of the street are the Rojos, led by brothers Ramón (Gian Maria Volonté), Don Miguel (Antonio Prieto), and Esteban (Sieghardt Rupp), who control the liquor trade; at the other end are the Baxters, led by the corrupt town sheriff (Wolfgang Lukschy), dealers in firearms. The Stranger decides to play both sides up the middle, using his fast gun and wits to gain a fortune. Complicating matters is Marisol (Marianne Koch), held captive by the Rojos, and separated from her debt-ridden husband, Jose, and their forever-crying son, Jesús. Can the Stranger help them and get the gold, too? Partly because Fistful was so widely imitated in other Euro-Westerns and even a few American films (e.g., Hang 'Em High, also with Eastwood), partly because Leone himself greatly surpassed and perfected the sub-genre he almost single-handedly invented in his later films, particularly The Good, the Bad, and the Ugly (1966) and his masterpiece, Once Upon a Time in the West (1968), Fistful of Dollars lacks the audacious, senses-blowing impact it had on European audiences in 1964 and American filmgoers in 1967, when it was new. The film's reputation also suffered slightly when it became obvious Leone had effectively stolen the plot and even recreated whole scenes nearly verbatim from Akira Kurosawa's Yojimbo (1961). 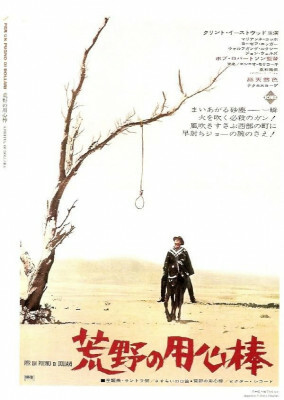 After Japanese producer Sanezumi Fujimoto screened Fistful, a lawsuit filed by Toho Studios and Kurosawa Productions soon followed, with Kurosawa famously writing Leone, "I have just had the chance to see your film. It is a very fine film, but it is my film. ... You must pay me." The case was settled out of court in 1965 whereby Kurosawa would receive 15% of Fistful's worldwide receipts vs. a $100,000 guarantee. Kurosawa and his co-writers of Yojimbo never received story credit on Fistful. While it's clear that Eastwood's performance was to some degree pattered after Yojimbo star Toshiro Mifune, and Ennio Morricone's music emulated the eccentric, genre-upending style and orchestration of Masaru Sato's score for Yojimbo, there's also no question each also brought an enormous degree of creativity and individuality to their respective work, particularly Morricone, one of the four or five greatest film composers of all-time. Not that Eastwood was slumming. He seemed to realize that to make his character work he needed to invest it with an understated if cynical charm that would click with audiences and make his opportunist palatable and sorta heroic. It's light years away from his Rawhide TV character, and one Eastwood used again and again with great success in the half-century-plus career that's followed. And while certain scenes in Fistful emulate their counterpart in Yojimbo - sadly, rights issues will probably forever prevent side-by-side frame comparisons - Leone's emerging vision of Western film is clearly taking root. While certain bits of Fistful are conventionally shot, the operatic qualities, extreme gritty close-ups and other hallmarks of Leone's Westerns begin to take shape here. The Italian remastering of Fistful of Dollars, while certainly a tad more yellow-greenish than U.S. prints and video versions, is hardly awash with these colors as was ruinously done with an early Blu of The French Connection, or the overuse of color blues drowning the original Technicolor-printed hues of so many classic horror titles. This approach is used sparingly and subtly, and supposedly matches the color pallet of the original Italian prints, which seems entirely believable. Nighttime scenes especially have cool rich blues that seem correct, and the extreme clarity of the image is, at times, a revelation. (A minor but welcome sight of this release is the appearance of the original '60s United Artists logo at the head.) The 5.1 DTS-HD Master Audio mix is outstanding; one really wants to blast Morricone's score through one's speakers. The 2.0 mix is also very impressive. The film is English only with optional English subtitles, and is Region "A" encoded. The vast selection of supplements are a mix of multi-repurposed material with some newly done material: audio commentaries by Tim Lucas and Christopher Grayling; a new video interview with Marianne Koch; a Trailers from Hell segment featuring director John Badham; original outtakes; image galleries; older interviews and the Monte Hellman-directed added scenes for the network television premiere; radio spots and trailers. I was expecting Fistful of Dollars to be razor-sharp but sickly green-yellow in appearance, yet was delighted to see the film overall never looking better (and this is after probably a dozen 35mm screenings, plus laserdisc, DVD, etc., etc.). Packed with extras to boot, this is a DVD Talk Collector Series title. * Yes, the ads call it A Fistful of Dollars but the onscreen title is plainly Fistful of Dollars and that, my friends, is the movie's title, as far as I'm concerned. ** The Stranger is called "Joe" a couple of times, but that's more of a nickname he's given. He is, after all, the man with no name.